A journey to find yourself maybe this sounds cliche but Rishikesh is all about that and much more packing inside this box of pandora where there is a thing for everyone. Situated in the Garwhal region of Himalayas this picturesque city has attracted pilgrim from all over the world from a long time ago. Since there are many yoga ashrams in Rishikesh, it has emerged as a big attraction for the peace and tranquility lover. When I said Rishikesh is a box of pandora I literally meant it since Rishikesh has amazing places to visit for a sightseeing lover, picturesque mountains for photographers, yoga ashrams for peace lovers and lots of adventure activities for adventure loving backpackers. It is literally a great journey which has many fascinating hurdles on the way to keep you entertained throughout your time here. So more than its neighbour Haridwar which only attracts pilgrims and devotees, Rishikesh attracts different type of travelers and backpackers from all around the world. Summers are the best tie to escape to Rishikesh if you live in a hotter region since it is close to hilly area it provides a fantastic climate during the months of April to June. Winters from November to January are amazing here as it gives you just the right amount of cold to have a remarkable experience and is preferred by many to visit during these months. These 2 swinging bridges are the biggest attractions in Rishikesh and attracts a lot of tourist from around the world to just get a chance to even walk on this bridge. Opened throughout the year this place is also important for the pilgrims which comes to this city since there are many temples situated on its both end. 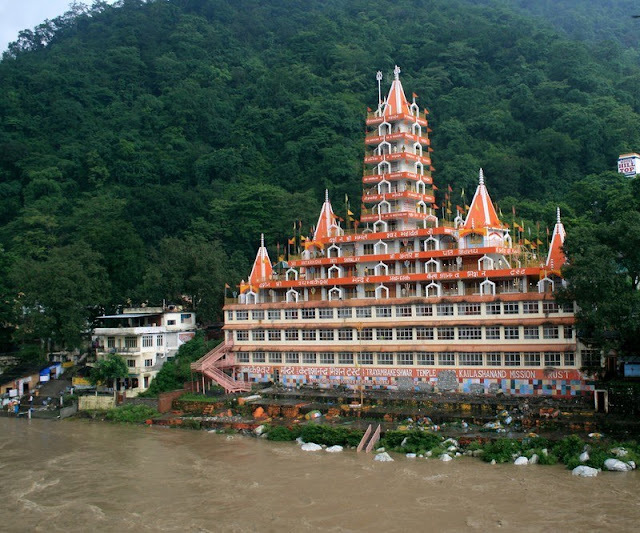 It is the secret Shiva Temple tucked away 12 kms away from the bustling city of Rishikesh. This picture perfect temple is as colorful a temple can be since it has been carved through different colors giving it a look like a canvas filled with colors. It also has a water spring which attracts a lot of devotees to take a dip in it. The most crowded place in Rishikesh, Triveni Ghat justifies every reason to be over packed with crowd since the evening Aarti is a delight for anyone’s eyes and heart. Devotees comes from all over the world to live this evening prayer session. Don’t forget to take your cameras here since it creates some of the perfect postcard image which will brighten up your picture gallery for a long time. 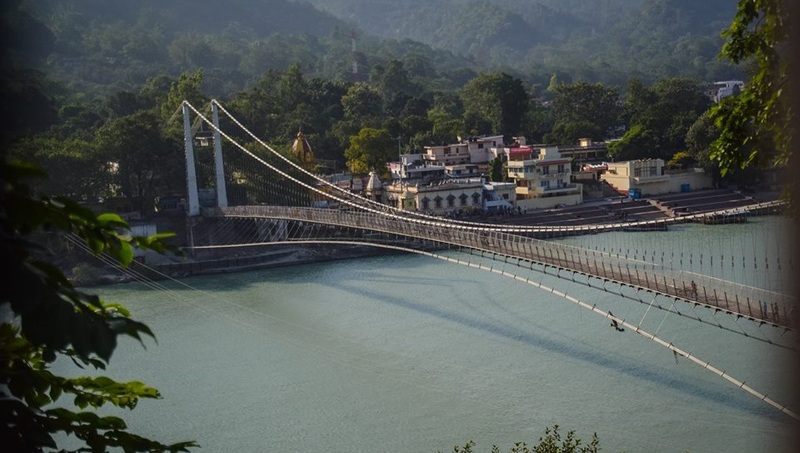 Only 2 km from the famous Laxman Jhula is jewel in the crown of Rishikesh since it is a mesmerizing lake with shimmering water dropping at rigged rocks from many feets above. It will require a little trek to reach here but it is worth every step you will take. It will freeze you in its captivity for a long time. Famously popular as Guru Shri Ram Sukh Das Ji is a giant complex which holds frequent satsang throughout the week to hold the hearts of pilgrims in their site. 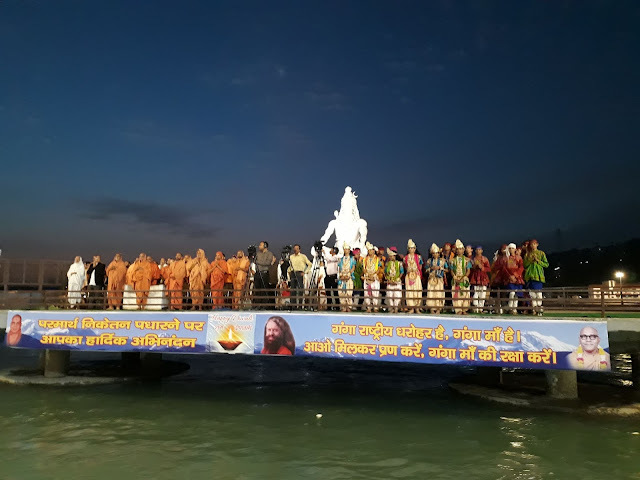 People comes in thousands to visit here and take a dip in the holy Ganga River and pure away themselves emotionally and physically. If you haven’t visited here in Rishikesh then you have visited nowhere since this is the oldest ashrams of India and will definitely give you something to take away in your heart and memory from this Ashram. It still holds it tradition and is perfect for anyone who loves to meditate and find themselves in the chaos of this world. A perfect place for anyone to try the most attempted adventure activity which is river rafting. Having the perfect setting to start rafting this place is filled with companies and organizers who organise river rafting. It closed during the month of Monsoons and during the other days of the year so you have to confirm before planning your trip for River Rafting. So with these 7 places to visit, Rishikesh has lots of things for the most remarkable journey of your life thus you should not wait and plan your journey right now to Rishikesh.